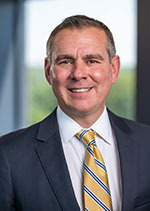 Prior to accepting the role of associate vice president and chief development officer at Michigan Medicine, Eric Barritt served as vice president of development, alumni and community engagement at Oakland University (OU) and the executive director of the Oakland University Foundation. In this capacity, he led a comprehensive advancement program for the university and oversaw a team of 75, including the offices of Alumni Relations, University Communications and Marketing, Major and Planned Giving, Annual Giving, Events, Corporate and Foundation Relations and Advancement Services. Since accepting the position in 2011, annual cash from philanthropy nearly quadrupled, new pledges tripled and the number of new gifts increased 40 percent. Applications and enrollment also grew substantially, while the quality of entering students also increased. In 2006, Eric was hired by the Detroit Medical Center (DMC) as corporate vice president of development and campaigns. He worked collaboratively with a team of more than 40 fundraising professionals at the DMC and, under his direction, the DMC fundraising increased nearly fourfold. Eric also led the implementation of a new donor database, a wealth screening system and a grateful patient giving program. From 1999 to 2006, Eric served in multiple roles at the University of Michigan, including director of development for the School of Kinesiology; the regional director of major gifts for the College of Literature, Science and the Arts (LSA); and director of development for the Life Sciences Institute (LSI). In all of these roles, Eric routinely worked with many of the university's largest donors, coordinated highlevel volunteers and increased fundraising results significantly. Eric began his career in fundraising in 1997 at St. Jude Children's Research Hospital, a world-renowned children's hospital that garners more than $500 million annually in philanthropy. He also served as director of major gifts at Oakwood Healthcare System — now part of Beaumont Health — working closely with Oakwood's Board of Trustees, major donors, volunteers and the Oakwood Healthcare Foundation staff. Eric has a Master's Degree in Public Administration, a graduate certificate in non-profit management and a Bachelor of Arts in Economics, all from the University of Michigan. He also holds a certificate from Harvard's Institute for Educational Management. He has served in leadership roles on numerous nonprofit boards and professional organizations, and in 2013 he was named to Oakland County Executive's Elite "40 under 40." Eric lives in Northville, MI, with his wife and two daughters.